If this is your first time as a canine parent, then you should know that there are several things you need to do and buy before bringing your new pup home with you. Like us humans, dogs have different habits and personalities - some good and some, well, not so good. Adopting a dog is like a box of chocolates: you never know what you're going to get! There's no telling how your new dog will behave, so it's best to prepare for anything and everything. Remove all sharp and protruding objects that can injure your new dog. It helps if you go down on all fours and crawl around your house so you can see what a dog sees. If you find something dangerous, take it out. Taping cut cardboard over objects you can’t remove is a cheap and effective way to dog-proof your home. Seal all outlets that are not in use. Tuck away all plugs and cables of your electronics so your dog won't chew on them. Keep everything you don't want your new furry friend to chew and destroy out of reach - shoes, toys, books, underwear, everything! Dogs can and will gnaw anything because it's fun and relieves their stress when they have separation anxiety. See our posts on ‘How To Reduce Separation Anxiety’ and ‘Tips for Crate Training Your Dog’. Add "Safe Zones" and "No Fido Zones" to your home. We know, these terms sound military! But you need to have military precision to help train your new dog to get accustomed to his or her new home. Your home will feel foreign to your new dog, and it will take a while for him or her to adjust to her new surroundings. Plan where your dog will sleep. It could be your bedroom or any part of the house except the basement and garage. Make sure you give Fido space where there is interaction with other people or pets in your house to make him or her feel welcome – You don’t want your pup to experience separation anxiety! Designating a safe space for your new dog is essential. Your pup needs to feel secure in her new surroundings, and letting her roam around in a large area may spook your dog or cause boundary issues between you and him/her. A crate with a dog bed inside is a good and safe spot for Fluffy to hang out until he or she gets used to their surroundings. Assign areas in your home where your new dog can go and seal off sections that are off limits. Creating different zones in your home is an excellent way to train your new dog where he can and can't go. A doggy gate is also a good option if you need to create a secure space for your dog, and you don't have a crate. Zoning your home is vital if you have other pets because it gives your tenured dogs or cats freedom to walk around they are accustomed to while they get acclimated with their new housemate and vice versa. Make sure your home is clean and parasite free. If you have other dogs, use an enzymatic cleaner to make sure the designated areas are clear of urine. Dogs potty on places where they can smell it, so...start cleaning! Double check the space where you want your new dog to stay and make sure it's free of parasites, especially if you have other pets. Newborn ticks (larvae) can live up to 540 days without a host and feed for 5 straight days when they find one. Yuck! Apple cider vinegar is a non-toxic way to kill these buggers. Speaking of cleaning, make sure you keep your cleaning products locked up. Many cleaning chemicals like ammonia and bleach are toxic to dogs. When your new dog arrives. Make sure you take things slow and steady. It takes anywhere from 3 days to 3 months for a new dog to feel at home in a new place, so please be patient. Expect to have a few accidents and hiccups along the way! 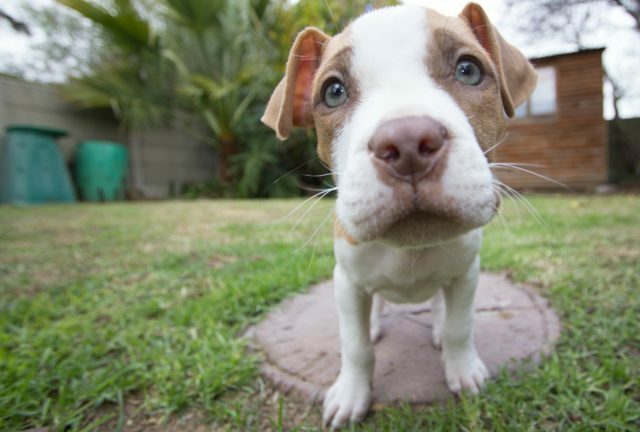 Take your new dog for a walk around your house, backyard, and neighborhood so he or she can get a lay of the land. If you have kids and other pets in the house, make the introductions stress-free. Try not to overwhelm your new arrival with hugs and kisses from everyone in your household or expect her to be chums with your other pets. Give any children instructions limit contact with Fido until he settles in. Once inside your home, place your new dog inside a crate or sectioned off area where you want him to stay and feel secure. Don’t force introductions to other pets in the home. Slow and steady wins the race, so be patient. Your resident pets are used to this being their space. Your new pup may have some anxiety in his or her new surroundings. Feel free to contact us if you need some integration tips for your new dog. Get a martingale collar to prevent your dog from slipping out of it if he or she gets excited or spooked while on a walk. Make sure to attach a dog tag with your contact information in case Rover runs off and gets lost. Using a harness is a great alternative for a martingale for walks. It is safe for your dog because it distributes the pull of the leash evenly. Harnesses are also help to prevent choking or putting pressure on their throat. Dog tags can come off and get lost. A microchip ID on your dog is forever. Make sure you register your dog’s microchip with the chip company so you can be easily notified if he or she is found. Take your new dog to the vet and have him or her checked out. Your vet will give your dog shots (rabies, DHPP, Bordetella and Canine Influenza). If your dog is not fixed yet, make an appointment to do so ASAP! It is healthier for your dog and prevents unwanted litters. Also, purchase deworming tabs and a flea/tick preventative such as Comfortis or Nexgard. NOTE: If you adopt a dog from a rescue, he or she should come with their complete set of shots. They also should already be spayed or neutered, microchipped and have had flea and deworming treatment. Your dog will chew anything that he can get his paws on, including furniture. Make sure to keep this behavior in check by getting him some chew toys to keep him occupied. Don't stick to one, get your new dog several toys because Fido also gets bored. Puzzle, tug and fetch toys. Walks aren't enough if you want to bond with your new dog or drain her of excess energy. Playing a puzzle game with Fluffy will keep her mind sharp and is as taxing as any physical activity. Alternate between the tug and fetch toys to keep your new pal engaged! The pure joy of bringing home a new family member and being a responsible dog parent is second to none. Before you embark on this beautiful journey, make sure that you dog proof your home for your new pup! Speaking of fur, if you have a dog that sheds a lot, like a husky, a rubber pet hair broom is a worthwhile investment – sweeping up dog hair with a nylon bristled broom is almost impossible. Don’t forget to get your new dog all the essentials she needs to feel secure and comfortable in her new surroundings. Get ready for some happy and unforgettable times! Best of luck and happy parenting!